Dunja Lavrova’s vintage-flavoured “Vinyl Grooves for Violin” programme consists of the sort of short pieces for violin and piano one finds on old American records. It features transcriptions of jazz standards, big band and classics made by classical violinists of the 20th century, including classics such as “Pale Moon”, “Easy to love”, “Old Folks at Home”, “Deep River” and many others. There are also various arrangements of Gershwin’s compositions (including “American in Paris” and “Porgy and Bess” suite) by Jascha Heifetz, as well as music of similar genre written by 20th century composers specifically for violin and piano (such as C.C.White’s “Levee Dance”, R.Bennett’s “Hexapoda” suite and C.Bolling’s “Suite for Violin and Jazz piano”). The selection also includes tangos by Carlos Gardel, Astor Piazzolla and Albeniz, as well as own original arrangements/ renditions by Dunja, music from the movies and more popular classics. 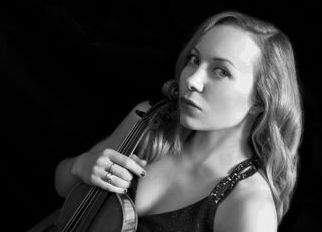 Classically trained at world renowned music institutions- Yehudi Menuhin School and Royal College of Music - Dunja has been performing as a soloist for many years and has won numerous awards, most notably the Tagore Gold Medal, which was presented to her by HRH Prince Charles. Apart from performing more traditional classical repertoire, Dunja equally enjoys and commits to performing the lighter selections and jazz arrangements. Dunja’s vinyl-record-inspired debut solo album, “My Dusty Gramophone” - a selection of miniature pieces popular during Golden Age of Violin era - includes some examples of that repertoire (you can hear some of them below). As Music Web International review of “My Dusty Gramophone” says, “she is a very stylish exponent of this repertoire” and BBC Music Magazine noted about her performance : “Lavrova gives her all with winning spontaneity”. Rob Cowan of BBC Radio 3 compared Dunja’s sound and performance to that of the legendary 20th century violinist Jascha Heifetz - the original transcriber and performer of Gershwin’s compositions adapted for violin and piano. American “Fanfare” magazine noted that Dunja’s recording of Jascha Heifetz’s arrangement from “Porgy and Bess”, "Bess, you is my woman now”, was “the only time they’ve ever heard played with so much intensity, and extraordinary sensitivity of phrasing”. Shortly after the release of the album, Dunja’s recording of “Deep River” featured on BBC Radio 6, and other tracks from her album have been played numerous times on radio stations worldwide, including BBC Radio 3. On a mission to revive the performing style and sound of the “Golden Age of Violin Playing”, which went hand in hand with the Golden Age of Hollywood, and is so closely associated with the sound one hears on the soundtrack to old movies, Dunja has been digging up old treasured scores for many years, bringing them to the audiences of today through her all-miniatures recitals, played entirely from memory. Most recently, Dunja, with her mission to revive this repertoire, has wowed an American publishing company Carl Fischer Music (established 1872), who have not only given her a permission to access their precious archives, where she has found numerous 1900s arrangements of popular songs for violin and piano; but she has also been invited to become the editor of re-publications of their archived violin and piano scores by an African American jazz violinist and composer Clarence Cameron White, which include one of Jascha Heifetz’s favourite encores, “Levee Dance”. Carl Fischer Music holds copyright to most of Jascha Heifetz's arrangements, as well as many other scores and arrangements by the great violinists of the Golden Age which Dunja hopes to bring back to life with this collaboration. Dunja has performed this type of repertoire at various venues and festivals such as Ronnie Scott’s Jazz Club, Soho Jazz club, Cadogan Hall and Wilderness Festival, and has collaborated with such jazz stars as Tina May, Liane Carroll and Gwilym Simcock. Dunja is a communicative and charismatic performer who enjoys involving her audiences also through speaking. She introduces the pieces and tells the stories and anecdotes behind them during her performance. Dunja’s passion for all things vintage extends through music-making into fashion, and she is proud to be an ambassador for the talented Polish designer Linni Ta, who has made classic vintage-inspired dresses for Dunja to perform in.